EIA published the latest EIA 914 on Friday, and January oil production fell 91k b/d m-o-m. But December production was revised higher to 11.963 mb/d. More importantly, the trued-up method shows US oil production likely flat from December to March 2019. The stalled growth scenario in Q1 was exactly what we wanted for a bullish playbook for the rest of 2019. Keep in mind, though, that the high exit production growth in 2018 will carry over to a high year-over-year growth figure in 2019. Welcome to the US oil production growth stalled edition of Oil Markets Daily! EIA published the latest EIA 914 on Friday with a massive revision towards December which saw production get bumped up to 11.963 mb/d. But January production was published as lower m-o-m by 91k b/d to 11.872 mb/d. More important, however, is that our method of tracking US oil production shows a stalled growth outlook for Q1 2019. You can see the trued-up US oil production figure projected a drop m-o-m before the EIA 914 was published. This means that February would likely see a bump up to ~12 mb/d before falling in March. For those that are following the oil market fundamentals closely, this is the exact same bullish scenario we laid out at the end of 2018. 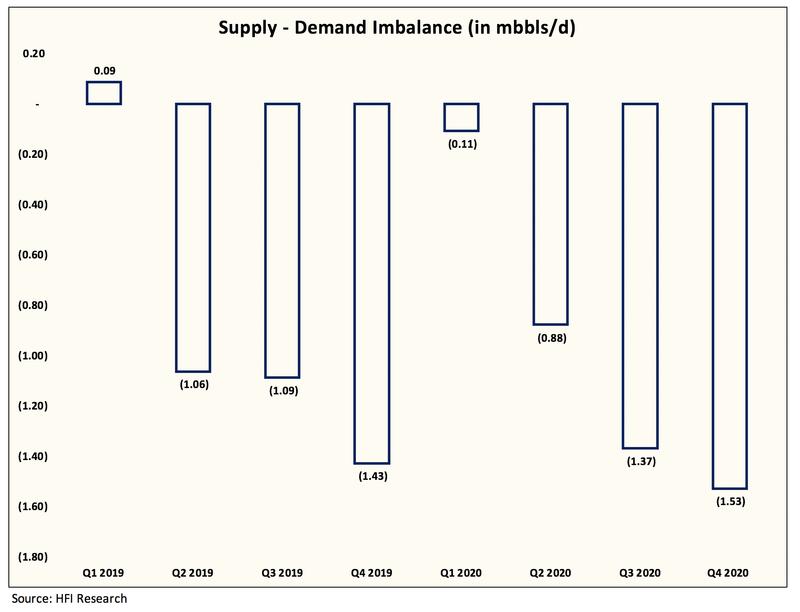 With oil prices where it is today, the market is completely ignoring the fact of what happens to the supply/demand equation if US shale just slows down for 3 months. We are not even talking about a decline in production but a mere flattening of production for 3 months. 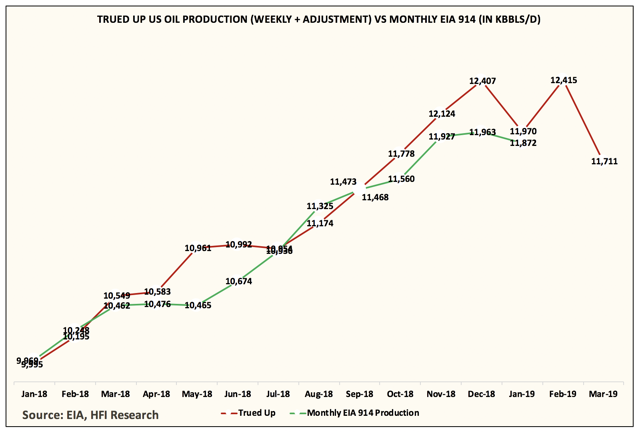 And, given the recent data we see in the EIA weekly reports and the latest EIA 914, we have strong confidence that US oil production did indeed finish the first 3 months of 2019 flat. While there are oil bulls that point to falling Permian rig counts as another factor, we do want to remind everyone that it's well completion that matters, not rigs that drive oil production growth. Nonetheless, with US oil production flat for the first 3 months of 2019, we expect US oil production to start growing in April and finish the year around ~12.9 mb/d. This would an increase of ~1 mb/d or a 50% reduction from the exit-to-exit growth we saw between 2018 and 2017. By 2020, the lower exit-to-exit growth will become more apparent in the year-over-year growth rates. Keep in mind that 2019 is skewed by the high exit production, so the year-over-year growth will still be ~1.8+ mb/d (total liquids). Thank you for reading this article. We recently launched our oil trading portfolio along with the HFI Portfolio. The oil trading portfolio is designed to take advantage of short-term long/short oil trades in the market. For readers interested in our positioning along with real-time trades, we are now offering a 2-week free trial. Come and see for yourself why we are the largest energy service on Seeking Alpha.